We passionately interpret ancient and contemporary stories expressed through music and associated art forms, giving audience experiences that live long after the last note has died. Inspired by human expression, history and the natural world… and constantly curious, we create concert events that touch multiple senses and cultures. We collaborate with distinguished and arresting creatives, bypass the worn highways and lure our audience into personal and deeply memorable experiences. In 2019 and beyond the Art Quartet will continue to intrigue and indulge, collaborating with some of our most celebrated painters, performance artists, cinematographers, composers, scent makers, scientists, social historians, photographers… and musicians. Embarking on a new collaboration with Bill Henson, one of Australia’s most compelling artists, the Art Quartet performs Chiaroscuro - an evocative, dreamlike response to Henson’s latest work. 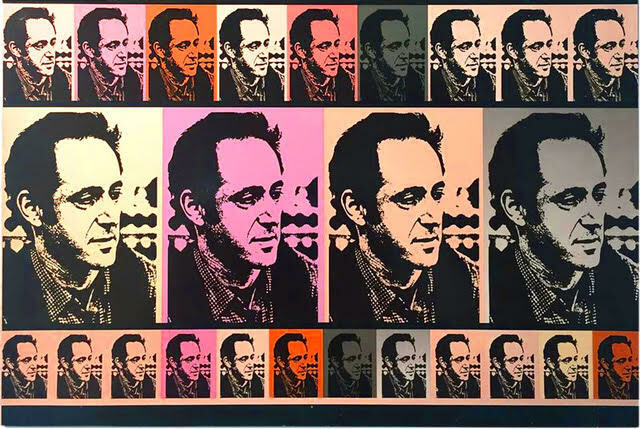 This concert is set within Henson’s exhibition at Roslyn Oxley8 Gallery, for two nights only. Anna Breckon & Nat Randall join the Art Quartet in a work that blurs the lines of artifice and reality, performer and observer. What is it that you see? John Olsen OA OBE is one of Australia’s greatest living artists and a national treasure. Join the Art Quartet, John and Greta Bradman in conversations & music about his inspiration and lyrical depictions of the Australian landscape. Music by Ross Edwards, Peter Sculthorpe & others. The Art Quartet presents a rare and intensely moving performance of Steve Reich’s Grammy Award-winning Different Trains combined with a dramatic cinematic installation by Gabriela Sá & Mariana Garcia (Brazil) and a special guest artist. Veronique has established herself as a versatile musician who enjoys performing classical repertoire, collaborating with composers, as well as rocking out with bands. Born in Sydney to a Mauritian family, she began violin lessons at the age of three with Suzuki teacher Magda Hammond and later Harold Brissenden. 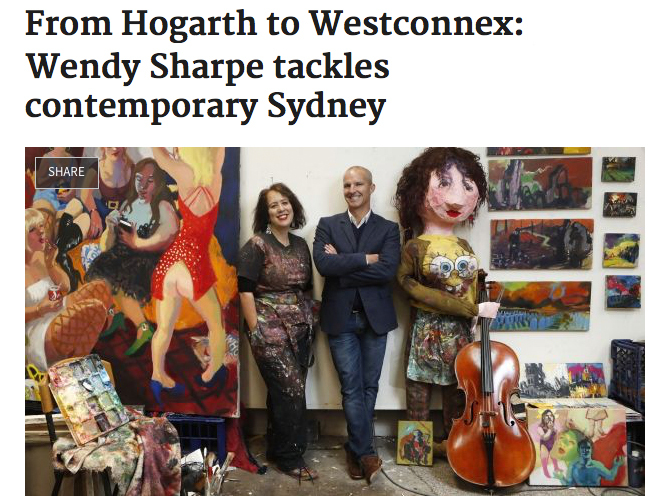 She was awarded a music scholarship to SCEGGS Darlinghurst and upon graduation pursued tertiary studies in Sydney with Chris Kimber and Alice Waten. During this time, Veronique was concertmaster of Camerata Australia, SBSYO, Principal 2nd of AYO, gave the Australian premiere of Boulez Anthemes and prize-winner at the Gisborne International Music Competition. She was awarded an 'opportunity grant' enabling her to attend various European Summer Schools where she was mentored by Jean-Jacques Kantorow, Regis Pasquier and Jordi Savall. She later engaged in a short period of study in London with David Takeno. Veronique frequently travels to Kuala Lumpur for her 'symphonic fix' with the Malaysian Philharmonic Orchestra. She has also played with the Sydney Symphony (holding the fellowship in 2004), the Australian Opera and Ballet Orchestra, Tasmanian Symphony Orchestra and the Sculthorpe Quartet, most notably joining them to perform at Gallipoli’s Dawn Service. Anna began violin lessons in Sydney at the age of 5. She graduated from Sydney University in 2001 with a BMus in Violin Performance and a Bachelor of Arts in French. Her love of the french language lead to an exchange to McGill University in Montreal during her final years where she studied violin, conducting and french. Having fallen in love with Montreal, Anna decided to complete her postgraduate studies at McGill University, studying with Ellen Jewett receiving a Licenciate Diploma in Violin Performance in 2004. During this time she developed an avid love of chamber music, whilst also touring nationally with the Orchestre de la Francophonie and attending the Domaine Forget summer academy, studying with Yehonotan Berick. Since returning to Australia Anna has worked as a freelance violinist in Sydney, currently performing with the Opera Australia Orchestra who she has played with since 2005. She has also performed with the Sydney Symphony Orchestra and the Sydney Philharmonia Orchestra. Keen to revisit the northern hemisphere Anna attended the Mozarteum Summer Academy in Salzburg where she studied with Yair Kless..
Anna has been a member of the Sydney Art Quartet since 2016 and she performs on a violin by Denis Cormier, Montreal. Andrew Jezek was born in Canberra and studied viola at the Canberra School of Music with Vincent Edwards and Charmian Gadd, graduating with honours in 1991. He continued his studies in Europe at the Hochschule für Musik in Munich with Jürgen Weber (viola) and at the Hochschule für Musik und Darstellende Kunst in Vienna with Karl Österreicher (conducting). He was co-principal violist of the renowned Viennese contemporary music ensemble Klangforum Wien from 1996 to 2013 and has performed at most major contemporary music festivals in Europe. He is a regular guest at the Salzburg Festival, Ruhr Triennale, Donaueschinger Musiktage, Wien Modern, Steirischer Herbst Graz, Wittener Tage, Wiener Festwochen, Berlin Festival, Venice Biennale and the Huddersfield Festival. In 2013, Andrew relocated to Sydney with his wife Emma and daughter Lila. 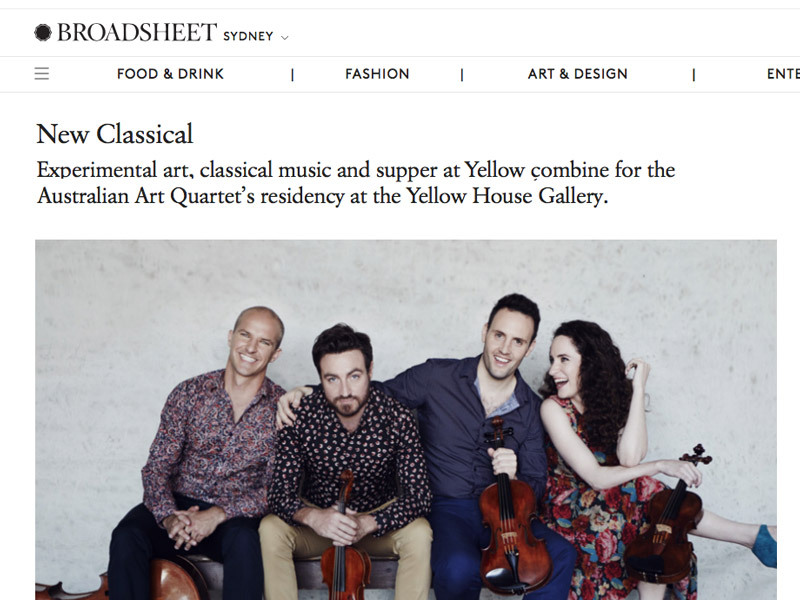 Andrew now performs regularly with the Sydney Symphony Orchestra, the Australian Chamber Orchestra, as guest principal viola with the Australian and Opera Ballet Orchestra and is also a member of the Australian World Orchestra. James studied cello performance at the University of Melbourne, Victorian College of the Arts, University of Western Australia & Sydney Conservatorium of Music. His teachers included Nelson Cooke, Michael Goldschlager, Susanne Wijsman & Susan Blake and then masterclasses with Bernard Greenhouse (USA), Steven Isserlis (UK), Bonnie Hampton (USA), Douglas Cameron (UK), & Hidemi Suzuki (Japan). As a member of the Australian Brandenburg Orchestra 1999—2012, James performed in many of the major cultural institutions and concert halls of Australia, UK, France & Germany. He is featured on the Brandenburg’s ARIA Awards for Best Classical Release (2010, 2009, 2005). James also performs with Pinchgut Opera, Sinfonia Australis, Ironwood, Perth Symphony Orchestra, Canberra Symphony Orchestra & Cologne Chamber Orchestra and is a regular in the recording studios of Sydney. James performs with an instrument attributed to Simone Fernando Sacconi and a range of modern and historic bows. James is a former Artistic Manager of the Australian Brandenburg Orchestra & General Manager of the Foundation for the Historic Houses Trust of NSW. James created the Art Quartet in 2015 to create music experiences and that connect audiences with a wider world of arts, sciences, culture and social history.